Plum is truly proud of this video. It is the first presentation designed for seniors which provides clear instruction along with interviews and discussions on the healthful art of Ch'i Kung. 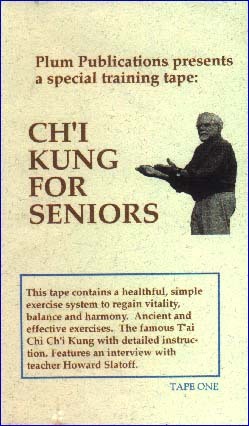 Emphasizing, as the Chinese do, that lifelong exercise is both desirable and possible, this tape teaches authentic Ch'i Kung that is easily performed at any age. The late Howard Slatoff, himself a senior practitioner, demonstrated each move of this simple set, accompanied by voice-over instruction. The film is enlivened with interviews, discussion & lecture on the meaning conveyed by the set. Howard was a true patron of the arts. Himself a fine painter and a well known art educator, he sensed the deep benefits and advantages of Chi Kung for the older person. This tape captures but little of his infectious—and from our personal experience—irrepressible enthusiasm. One of our best, simply.